The International Watch Company may be one of the luxury watch brands you’ve seen more of because of how popular they are. Founded in 1868 by Boston native, Ariosto Jones, he wanted to combine the greats: America’s high technology with the fine craftsmanship from the Swiss watchmakers. The company quickly gained more recognition soon after they made their first model, Jones Calibre. 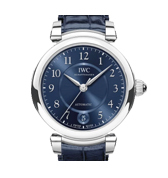 Today, a few of IWC’s most popular models include the Portugieser, Aquatimer and Portofino. 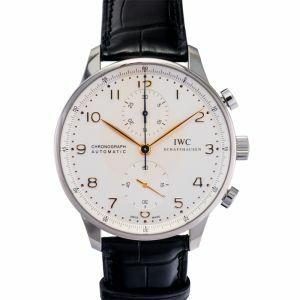 The International Watch Company (IWC) was founded in 1868 in the medieval town of Schaffhausen. It was in this town in Northern Switzerland that Florentine Ariosto, an American watchmaking pioneer gave shape to his dreams. 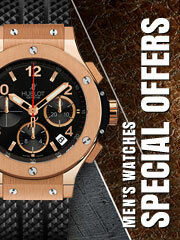 He teamed up with some the most professional Swiss watchmakers to make the most top-notch timepieces ever made. Using the Rhine River as the source of energy, he established a place that could design the best movements and craft. 150 years since then, IWC continues to produce some of the most refined timepieces ever made. The brand’s philosophy is sweet and simple; to create with a passion. It is to create watches that are not only pleasant to look at but also function with precision and clarity. The brand hopes to deliver pieces which not only focus on the design but also the technology used. Having upheld their values and a reputation for quality, IWC is now considered a leading brand in the watch market. Since its foundation in 1868, the brand has propelled itself. By upholding all their promises of luxury and comfort, the brand has made its own place. Each piece from IWC is assembled by hand by a professional. In fact, the entire watch itself is the epitome of brilliant craftsmanship. It is like IWC to always pay close attention to all the details. Even the minute details are so well done that they are hard to ignore. The company gives great priority to designing pieces that not only look good but also have the best functionality. That is why IWC especially has a team of construction engineers that make sure to provide us the best of both worlds; well-crafted designs with the best of modern technology. These tests are specially developed to observe how the watches may react to conditions encountered every day. Utilizing the process of “failure mode and effect analysis” (FMEA), the parts of the timepiece are all checked at the earliest stage of development. Parts like the tooth profiles, shafts, dimensions of the springs, and the wheels are all scrutinized heavily to detect any possible flaws. In case any flaws are detected, the parts are rejected and excluded from the production process. 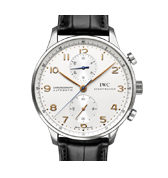 IWC features a variety of some of the most fashionable and intricately crafted collections in the market. Within each collection, you will find a wide choice of designs. With so much to choose from, you are bound to find something that touches your heart. 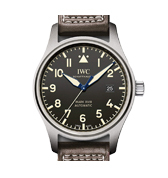 The IWC Big Pilot’s Watches were one of the first collections the company unveiled. This watch in the Pilot’s collection tracks back all the way to the beginning. The watch is characterized by a classic design featuring a Pellaton automatic winding system and two barrels that build up a power reserve for up to 7 days. The case is 46.2mm stainless steel with the iconic Junkers JU-52 place engraved in the back. The strap is a beautiful black calfskin made by Santoni; an Italian brand renowned for their leatherwork. 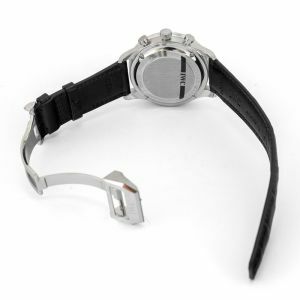 Furthermore, the watch has a soft iron inner case that protects the movement of the watch from magnetic fields. As for the glass, the watch is specifically designed with sapphire which protects the timepiece against drops in air pressure. This piece from the Pilot’s collection is another extraordinary addition. Also hosting the engraving of the Junkers JU-52, this is one of the highest functioning watches of the lot. 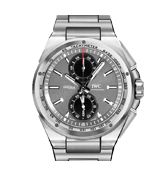 Its 79320-caliber chronograph movement enables it to record both single and aggregate times of up to 12 hours. The watch has a 44-hour power reserve and is automatic and self-winding. It has an elegant black, luminescence dial and a matching black calfskin leather strap by Santoni to go with it. It has the added features of the date and day display. 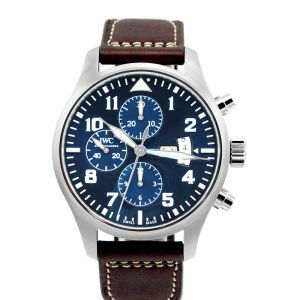 Like other watches from the Pilot’s collection, this watch also has a sturdy sapphire glass to protect it from differing air pressures. 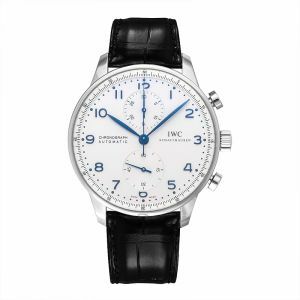 Catering to men with a sportier taste, this timepiece is an example of the great variety of IWC men’s watches. The dial is the most radiant hue of cobalt blue with a complimenting rubber strap. The watch is water-resistant to up to 6 bar and has an energy reserve of up to 68 hours. This radiant timepiece is powered by an 89361-caliber chronograph movement with an added fly back function. This function aids in recording consecutive times such as laps. In addition to that, the watch is self-winding and automatic. The stainless-steel case measures to a total of 43.5mm with a see-through sapphire glass back enhancing the look of the design. 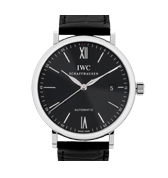 Watches from IWC ensure the highest quality paired with the most sophisticated designs. 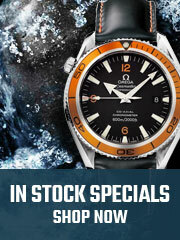 The durability of these watches allows them to endure with you through harsh conditions of time. With their state-of-the-art technology, you can always count on these timepieces to record for you all the moments that actually matter. 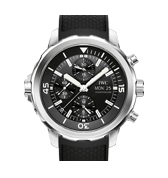 So, shop IWC watches and add these exceptional timepieces to your collection! When you’re looking for an elegant watch, we highly suggest taking a deeper look into IWC’s Portofino collection. Sporting more of a laid-back style, the Portofino collection offers timeless pieces. 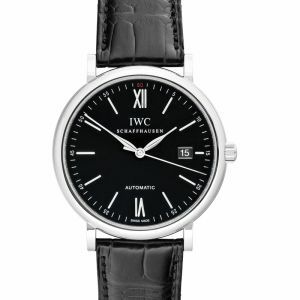 Being one of IWC’s more successful watches in the men and ladies watch community, the Roman numerals and features make it a forever classic.